Neck - Fairly long, without throatiness, well enough muscled to form a slight arch at the crest. Set smoothly into nicely sloping shoulders to give an elegant look. Topline - Level both when moving and standing. Body - Short-coupled with ribs well sprung but not barrelled. Chest moderately deep, extending to elbows allowing ample heart room. Slightly less body at the flank than at the last rib, but with no tucked-up appearance. Tail - Well set on, carried happily but never much above the level of the back, and in constant characteristic motion when the dog is in action. Docking is optional. If docked, no more than one third to be removed. Click Here to Learn about breeder background checks on Cavalier King Charles Spaniel breeders if you are looking for Cavalier King Charles Spaniel puppies for sale. 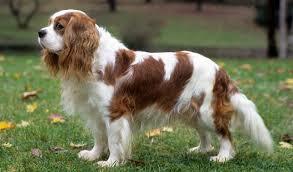 Click Here to learn how ResearchBreeder.com can help you find healthy Cavalier King Charles Spaniel puppies for sale. Click Here to order a Breeder or Kennel Background Check on Cavalier King Charles Spaniel Breeders that may have Cavalier King Charles Spaniel puppies for sale. Click here to find the national breed club for Cavalier King Charles Spaniel puppies for sale. Click Here to purchase a list of approved ResearchBreeder.com Cavalier King Charles Spaniel Breeders who have Cavalier King Charles Spaniel puppies for sale.